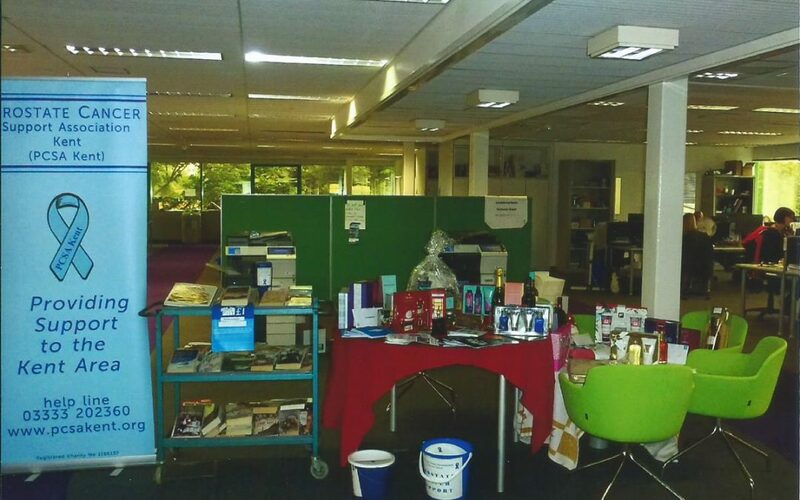 On 31st May Angela Peall organised a fundraising and awareness day at her place of work, Folkestone & Hythe District Council. Her chosen charity was PCSA Kent and the day was in memory of her father, Bob Hutchinson, who was an active and committed member and very much missed by all those who knew him. Angela had arranged a raffle and managed to obtain 52 raffle prizes – in itself a real achievement. She also organised a book sale, “make your own ploughmans” and a wonderful array of cakes. Angela put a great deal of thought and effort into raising awareness of prostate cancer, with facts and figures on her posters advertising the day and an array of booklets and leaflets available, including our Below the Belt leaflets. The day was a great success and Angela raised a magnificent £488.37. We are extremely grateful to Angela and her colleagues for their support. In addition to the sum raised by Angela Royal Mail have donated £100 as a result of a recent research initiative. PCSA Kent is very grateful for this further donation.